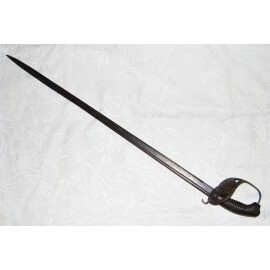 Prussian cavalry saber (imperial Germany) 1889 model, straight blade with contrast crowned marked ERFURT, curved wooden handle, guard with image of eagle. Some point of rust but in general good state of conservation. MEASUREMENTS: total length 98 cm. blade: 82 cm saves 15 x 12 cm.